Homemade granola – fresh from the oven! My very good friend Amber is an inspiration for me on so many levels – with the love she has for her family and her sweet son, with her abundant source of creativity and inventiveness, with her dedication to health and helping other people feel the very best they can feel with her personal training business Happy Human, with her honesty and compassion and being the the most amazing friend. Thank goodness for friendships that cross oceans (and email and Skype! ), because I don’t think I could have left America otherwise. When it comes to fitness or baking or knitting or cooking or crafts or gardening (or just about anything else…), I wish I could cross the ocean and plop down on her sofa for a nice conversation. I’ve been meaning to give a try at making granola for ages now, and finally gathered up most of the ingredients I could find in Amalfi this weekend. 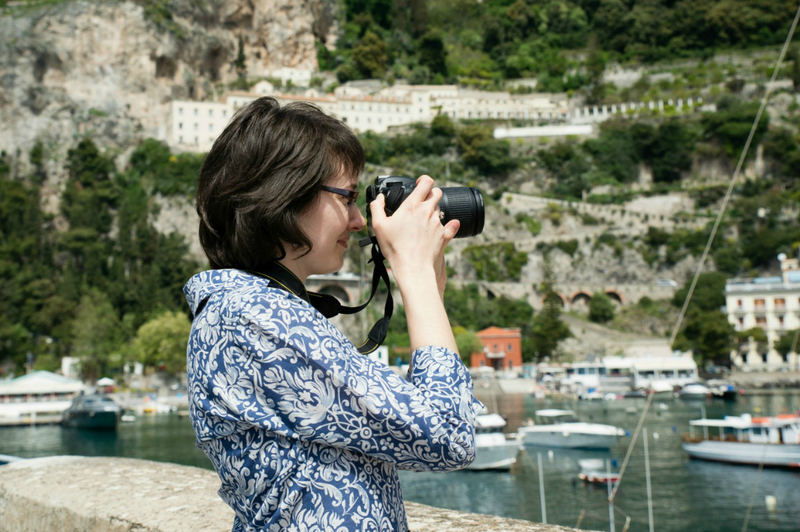 After poking around on the internet for recipes, all of which were too complicated and included ingredients nearly impossible to find on the Amalfi Coast, I had a flash. With a quick search in my email I had it – Amber’s granola recipe! I still had to make some modifications since I didn’t have maple syrup or bran, but it was easily modified and was the perfect base for inspiration. Amber brings creativity to everything she does, which is just one of the many lessons I’ve learned from her over the years. What do you like to put in your granola? 1. Mix all ingredients together except the raisins or dried fruit. Spreading out the granola on a baking pan – ready for the oven! 2. Spread out on baking pan and bake in preheated oven at 300 F/ 150 C for about 30-35 minutes, mixing and turning over about every 10-15 minutes. You want the granola to bake evenly, but not burn. The house will smell heavenly! Mixing raisins into the granola after cooling. Look at the lovely golden color! 3. Let cool and mix in raisins or dried fruit if desired. After cooling completely store in airtight container. Note: This made one large jar of granola when finished. Since it was my first try I didn’t want to waste the precious oats (yes, they’re expensive in Amalfi!) and just made a small batch. Looking forward to breakfast tomorrow already! One of the best things about granola is how flexible you can be with the recipe. I happened to have some molasses sitting around that needed to be used. But if you don’t have that handy, replace it with maple syrup (like Amber makes it) or use more honey. Add more nuts like sunflower seeds, sesame seeds or cashews, add other spices that you like or leave out the cinnamon if you don’t care for it, add wheat germ or flax seeds … whatever you like! Keep a note of what worked and didn’t work so you’ll remember next time. Since I used quick cook oats, I think I’ll need to experiment a bit more to make a clumpier granola. Thanks for the inspiration, Amber! If you have any granola making tips or favorite ingredients, I’d love to hear! Weekends in August are generally a time to avoid the beach on the Amalfi Coast. Crisi or no crisi, I swear half of Italy is on the beach in Amalfi this time of year. With hotter than usual temperatures right now, unless I can nab a spot close to the edge of the water I feel like reenacting the “I’m melting … m…e…l…t…i…n…g” scene from Who Framed Roger Rabbit. Yeah, it ain’t pretty. I’m happier to head to the beach early in the morning during the week when it’s less crowded or just wait until things quiet down a little bit at the end of the August. Since it was too hot to head to the beach yesterday, we went the other direction up into the mountains above Tramonti to one of my favorite restaurants. The drive through the pass up to Tramonti was quiet and peaceful, worlds away from the August chaos in Amalfi. After lunch I looked up at the big chestnut tree we parked under for shade and noticed the bright green chestnuts growing in their prickly burrs. On such a hot day it was refreshing to have a reminder that autumn is on its way. 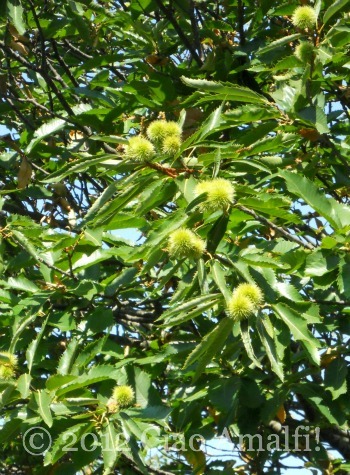 Soon it will be time for the chestnut harvest and the Festa della Castagna in Scala. I want to hold on to the warmth of summer and the beach days as long as I can, but seeing the chestnuts growing is a nice reminder that there are many beautiful–and cooler–days ahead!